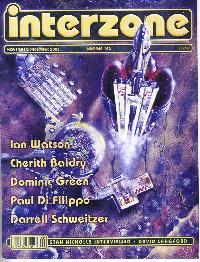 With this issue Interzone moves to a bi-monthly publication. Irritatingly for the anally bibliographical amongst us, the previous issue, 191, was dated September, so October 2003 has disappeared into the aether. Paul Di Filippo. A Monument to After-Thought Unveiled. Di Filippo takes poet Robert Frost down a road less-travelled : a road in which his trip to England does not take place on account of his wife and children burning to death in a fire at their farmhouse. Frost’s career as a writer of eldritch horror stories sees him play a role in the success of HP Lovecraft, and a co-writer of Lovecraft’s, Hazel Heald, has a role to play in enabling Frost to turn his life around at age 50, back onto the path that he left half a lifetime previously. Watson’s Oxford-based policeman, Wellington Web, is an addition to the ever-increasing number of British policeman/sleuths, following in Inspector Morse’s footsteps (or, rather, driving in a similar classic car) in the dreamy spires of Oxford (note: Inspector Morse is an intellectual cop based in Oxford who drives a classic sports car, well known through the novels of Colin Dexter and the ITV tv serial). Webb spouts Latin, and is an afficionado of coffee, but has his style rather cramped by having his pet dog’s head inter-dimensionally drafted onto his arm whilst dealing with a xeno-murder. Or is it a murder? Webb is able to solve the politically delicate situation by dint of realising that the aliens who are poking from another dimension are in fact not living creatures themselves, but constructs of those which live in the other dimension. The story doesn’t completely work for me, partly due to the chronological cutting and pasting, and falling between the stools of comedy and whodunnit. Also, a grating error – using ‘eluded’ instead of ‘alluded’, and being told twice that a trendy coffee shop doesn’t provide ‘egg and chips’, suggests a lack of proof-reading. Cherith Baldry. More Fools Than Wise. A near-future England in which a police state is ruthless repressing (an imagined) opposition sees a young man returning to his family home to confront his past and current fears. The family home hosts a mysterious secret, which offers him an opportunity to escape. The unexplained nature of the mysterious forces within the house rather grates for me, in a story which is okay as far as it goes, but feels just a little unclear as to what it is trying to say. Darrell Schweitzer. They Are Still Dancing. A follow-up to ‘The Most Beautiful Dead Woman in the World (issue 189) which I thoroughly enjoyed. However, this story rather re-treads the previous one and doesn’t take forward the story much, and it reads a little sub-Richard Calder. Dominic Green. Send Me a Mentagram. A science thriller from Green in which a ravenous bug, far worse than necrotising fascitis, is wreaking havic on scientific and military personnel in the Antartic. Meteorites from Mars are at the top of the list of suspects. Have those meteorites, long buried in ice, introduced this flesh-eating horror. Or is the answer closer at home? In true X-Files fashion, the protagonist is in a race against time to find the answer. A reasonable collection of stories to meet most tastes, without there being any real standouts. The reviews and commentary are a little thin on the ground considering that with the number of ‘missed’ issues in recent months you would have thought that there would be a backlog of such content.